Special Containment Procedures: Due to SCP-3696's distance, mass and size, any physical means of containing SCP-3696 using technology currently at the Foundation’s disposal is impossible. Implanted Foundation agents in major observatories and space programs are to contain images of SCP-3696, research data of its gravimetric effect2, as well as scientific theories which would cast doubt on the ongoing cover story. An ongoing misinformation campaign is in effect, currently aimed at perpetuating the existence of the Norma Cluster to ease compliance with current physics models. This campaign has thus far been able to completely suppress any knowledge pertaining to SCP-3696 from public awareness. The Foundation’s DEep spaCE anoMalous oBservER (DECEMBER) satellite is to monitor SCP-3696 from an Earth-trailing orbit and report all sudden activity regarding SCP-3696 to Foundation Observation Sites. Description: SCP-3696 is an intergalactic gravitational anomaly located at the center of the Laniakea Supercluster3. The anomaly’s position on Earth’s celestial sphere resides within the area of the sky which is obscured by the Zone of Avoidance. This makes SCP-3696 currently impossible to directly observe due to the obscuring effects of the Milky Way’s galactic plane. As such, the properties of this anomaly were determined by noting its measurable effect on galactic clusters across a region of several hundred million light-years. Measurements taken of SCP-3696 suggest that it is a highly localized concentration of mass many thousands of times more massive than the Milky Way galaxy. Current physics models place such a mass-heavy physical structure as an impossibility. In addition, current gravitational models using data recorded by the Foundation’s ‘DECEMBER’ satellite suggest that SCP-3696 is attracting the Milky Way’s galactic cluster towards it at a rate of 7.1 Mm/s. 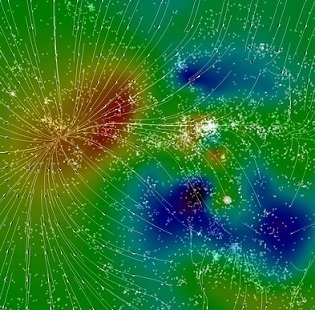 Galactic clusters determined to be opposite SCP-3696 from the Milky Way’s are all blueshifted, in accordance with Hubble’s Law, indicating not only that they are approaching SCP-3696 relative to the Milky Way’s and to each other, but the variations in their blueshift are sufficient to reveal the existence of the anomaly. The variations in their blueshifts cover a range of velocities from about +700 km/s to +100 km/s, depending on the angular deviation from the direction to SCP-3696. Variation in velocity was also dependent on distance from SCP-3696, with a range covering ███ █m/s to 5.1 Mm/s. Should the Milky Way follow this velocity trend, galactic ██████████████ as a result of SCP-3696’s gravitational influence is expected to occur in ███ million years. SCP-3696 was first discovered by civilian astronomers in 198█ following a series of observations by X-Ray astronomer Dr. ████ █████ in █████,█████████, the target of which appeared to violate the idea of uniform universal expansion. SCP-3696 has only continued to display properties which place it in stark opposition to conventional astrophysical theory. Following Event-3696-20██-09, it is imperative that the Norma Cluster cover story is upheld with the utmost priority. Efforts of Sites tasked with observing SCP-3696 is to be focused on recording any similar incidents, discern how SCP-3696 was able to ██████████████ an entire galaxy in just █ hours and develop methods to stop the process. ██/09/20██: 08:20 UTC - DECEMBER satellite records a steady growth of Cherenkov radiation coming from the area of space taken up by SCP-3696. Hawaii and Atacama Observation Sites (respectfully hereon referred to as HOS, AOS) alerted. ██/09/20██: 08:40 UTC - HOS relays confirmation of DECEMBER’s findings as background radiation levels spike. Cover story of a powerful gamma ray burst passing close to the stellar neighborhood prepared while observations of SCP-3696 continued. ██/09/20██: 08:50 UTC - AOS reports that the exact source of the radiation is a galaxy ███ thousand light years from SCP-3696, hereon referred to as DW-8252. ██/09/20██: 09:10 UTC - HOS reports faint long-wavelength radiation trailing the Cherenkov surge. Several minutes later AOS announces that DW-8252 has dramatically blueshifted and is rapidly increasing in velocity. ██/09/20██: 09:30 UTC - After double checking their equipment for faults, AOS reports that 0.██% of stars in DW-8252 have gone superluminal. ██/09/20██: 10:20 UTC - HOS confirms AOS’ report. ██/09/20██: 11:30 UTC - DECEMBER reports that background radiation levels have begun to stabilize at ██% above normal levels. ██/09/20██: 11:40 UTC - AOS reports that ██% of DW-8252’s stars have gone superluminal. HOS reports that considerable distortion of DW-8252 is visible. ██/09/20██: 11:50 UTC - The background radio wave has begun to blueshift. AOS begins analyzing signal. ██/09/20██: 12:20 UTC - A galactic arm of DW-8252 is reported to have flown apart. ██/09/20██: 13:50 UTC - HOS reports DW-8252 has gone superluminal. Cherenkov radiation peaks. Galaxy is reported to have been thoroughly ██████████████ prior to Cherenkov spike. DECEMBER shows that ███████ stars remain. Background signal persists. ██/09/20██: 23:50 UTC - Remains of DW-8252 is scattered across a region of ████ light years. Cherenkov radiation dissipates. Cover story released. Background signal weakens. Analysis of signal: Background signal was determined to consist of three pulses of powerful radio radiation on a repeating timescale of three seconds. The initial and final pulses were identical. The second pulse seemed to change after few repetitions of the signal. Signal abruptly self-terminated ███ days after Event-3696-20██-09. 1. Red areas denote areas of high gravimetric intensity, blue denotes areas of weak gravitational interaction. SCP-3696 takes up most of the left side of the image, the Milky Way's Local Group is included in the center-right. 2. See attached image file, strength is far in excess of even the most massive black holes. 3. Contains the Milky Way and over 100,000 galaxies.